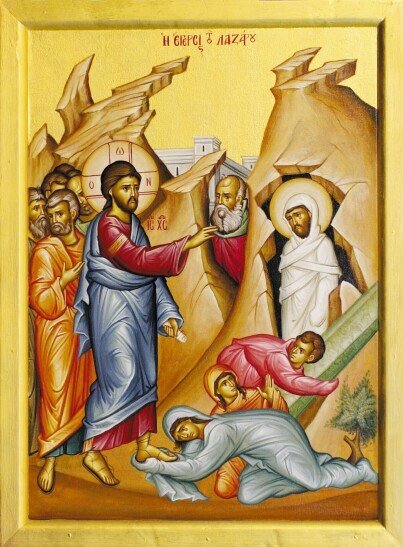 Yesterday’s gospel reading the healing of the daughter of Jairus (Luke 8:41 – 56) also encompasses the healing of the woman who had a flow of blood. This miracle and, miracle within the miracle, speaks unambiguously about the nature of faith. Notice that Jairus besought Christ to come to his home to heal his 12 year old daughter who was dying. In the mind of the leader of the synagogue the physical presence of Christ was necessary so that his daughter could be healed. His faith was limited indeed! His faith could best be described as: “I believe” Contrast that with the declaration of the Centurion in Matthew’s gospel who declares to Christ when Christ offers to come to his home to heal his servant: “Lord I am not worthy to have you come under my roof; but only see the word, and my servant will be healed.” (8:8). Then we come to the faith of the woman of the flow of blood. Here her faith is great. She takes the idea of faith to a different level: she transforms from the “I believe” of the ruler of the synagogue to the “I know”. Her faith is powerful and transformative. She has no doubts that she will be healed if she can only touch the hem of the garment of Christ. Now here’s the lesson: Christ declares that someone touched him because power had gone out of him. Had not the milling crowd jostled him? Yet, power went out of him involuntarily in response to the faith of this woman. Christ’s healing accordingly can be said to be freely and spontaneously given to those who have a faith level understanding of “I know” as opposed to “I believe”. So, where is the intersect between the “I know” of my faith in the providence of God? Can I be saved through my faith? The answer is that there is a synergy between God and me. That means that I am obliged to work and deepen my faith and then trust in the “I KNOW” of God. Now there is the mystery! Tomorrow Tuesday, there is a busy bee to tidy up the garden and surrounds of the church. This will commence from 9 AM. If you can, please come and assist. Thank you. Programme for this week is as follows: tomorrow evening (Tuesday) at 6:45 PM ” human free will and Divine Providence – and what does Psalm 139 mean anyway?” (Please bring your Bible); Thursday feast day of St Cosmos and Damien – matins from 7:30 AM; Saturday divine liturgy in English from 9 AM to 10:15 AM. On 9 November we commemorate the feast day of our church. We will be having a sweet/savoury stall. To those of you who can bake, slice, dice, cook or create now is your chance. To those of you who cannot now is your chance to be a consumer. On 11 November will be having our major fundraiser namely our luncheon at the Greek all of St Alexander the Great. Tickets are $30 for adults. $10 for children between 1 16 years and five years, under five years of age no charge. Please attend and support our church. Your material help goes towards the needs of the church. Our food store continues to have increasing calls upon it. We now require tens of being/chickpea/pulses. We do not need baked beans or spaghetti. Tinned meat and fish is required. We also need plain flour, sugar, tinned tomatoes and tinned fruit. If you wish to help financially the account details that our store operates from are: BSB 082057 account 616004624. Life is never static. We all grow. The question is do we grow up or do we just grow old!